Over the years, I have accumulated a very extensive motocross and off-road brochure collection. I use these brochures in crafting my CLassic Steel articles fro PulpMX.com and love going back and reading them from time-to-time. For me, I just love seeing how the bikes looked when they were new and looking back at the technology that was hot at the time. Over time, I thought I would post some of these classic brochures here for everyone to look back on and enjoy like I do. 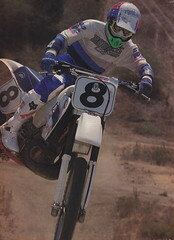 For this first one, I thought we would go way back and put out one from the early days of current powerhouse KTM. This one is from 1978 and it shows the 125, 250 and 400 motocross models, as well as a few of their woods models as well. Prior to 1978, KTM models sold in America were actually marketed as Pentons, due to the work of Jack Penton, who had convinced KTM to get into the dirt bike business in the late 60s. Back in 1978, KTMs were a rare sighting on the motocross courses of America and chances are you would not have seen one of these models outside of the rare GP or Trans AMA appearance. Still, they are pretty cool looking bikes and a great view back at the origins of the orange team that dominates much of motocross racing today.